(Neu-Isenburg, 02-27-2019) To stand out from the crowd, to swim against the current, to be unadapted and unique – this is called individuality. Harley-Davidson has been supplying the matching motorcycles since 1903. And yet they are nothing more than a blank canvas on which their owners let off steam in search of the perfect expression of their very own personality – which is why no Harley is like any other. The Harley-Davidson dealers are responsible for the individualization of the US bikes, and they prove their ability in the art of customizing year after year in the Battle of the Kings. In 2019, the big Harley-Davidson customizing contest takes place worldwide for the first time, as the US dealers are now also involved. The custom bikes, which were built around the globe last winter, first competed against each other in the national competitions. Online voting was allowed here and thousands of motorcycle fans from all over the world did not allow themselves to be asked twice. Until the middle of February, they wiped and touched what they could, and now the national winners have been determined. 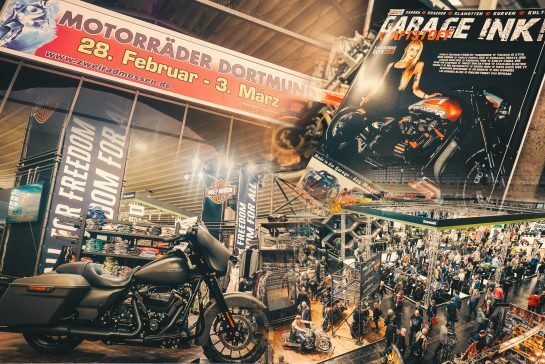 In Germany, Thunderbike Harley-Davidson Niederrhein won the race, closely followed by the Harley-Davidson representatives from Bielefeld and Düsseldorf. The Hamminkelner company has taken on the youngest and sportiest offspring of the Softail family, the FXDR 114. “With our conversion called ‘Roar’ we wanted to emphasize the racing character of the bike and deliver a flat and evil dragster conversion for this year’s Battle,” says Managing Director Andreas Bergerforth. Among other things, a lowered chassis, a fat 260 under a redesigned rear, a new seat and front fender as well as several components from the Harley-Davidson Dominion accessory collection contribute to this. The engine was doped with a Screamin’ Eagle Stage 3 kit and Thunderbike chose to add a silver tone to the Harley-Davidson colours black and orange to enhance the redesigned shape of the machine. “Congratulations, Thunderbike, and many thanks to all the other customizers in Europe and all over the world who took part in our competition with vigour and skill,” comments Christian Arnezeder, Harley-Davidson Managing Director Central Europe. Now that the national winners have been determined, it’s time to choose the four best non-American bikes. Once again, a public vote on the World Wide Web will decide. The four finalists who will emerge from this voting will then compete in November at the EICMA motorcycle trade fair in Milan against the four best conversions made in the USA. At this final showdown a jury of experts will choose the world champion in the “Battle of the Kings” contest. So you can continue to be curious!